Show the level. Swipe left on the Compass screen. Hang it straight. Hold iPhone against a picture frame or other object, then rotate them until you see green. For true level, the deviation is displayed on a black background. If the background is red (indicating relative slope), tap the screen to change it to black. Level the table. Lay iPhone flat on the table. Match that slope. 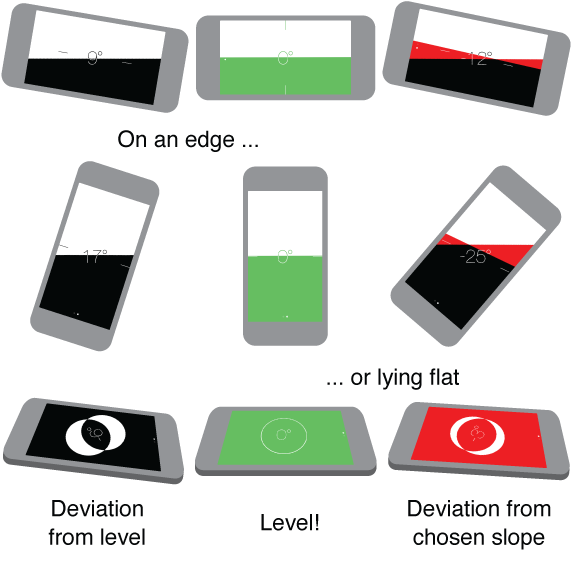 Hold iPhone against the surface you want to match, then tap the screen to capture the slope. The slope you seek is shown in black, with deviation shown in red. Tap again to return to standard level.